simply h² : WWIB? Chime In On These Fashion Faceoffs! WWIB? Chime In On These Fashion Faceoffs! Celebrities are bound to wind up in the same outfits sometimes, but the question is, Who Wore It Best? 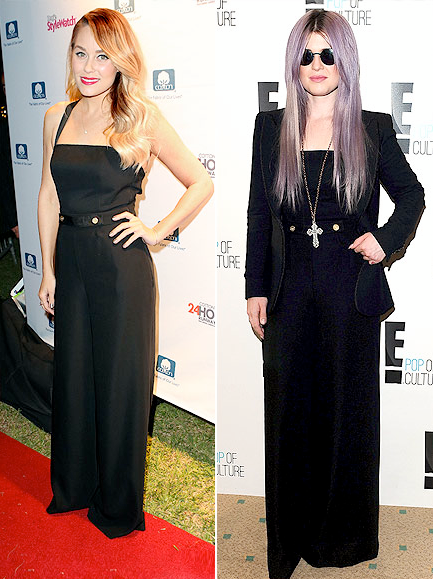 First, we have both Lauren Conrad and Kelly Osbourne in a Camilla and Marc black jumpsuit. These two looks are completely different! Lauren's look is very sweet and playful, while Kelly's is much more edgy and daring. I personally like Lauren's look better. What do you think? Next, we have Twilight actress Ashley Greene and reality star Khloe Kardashian in an Antonio Berardi white dress. Ashley kept the tight fitting dress long and sophisticated, while Khloe shortened it for the Kid's Choice Awards. I think that both of the styles fit the girl's personality, and both of the complete looks look great! But in comparison. I love this dress on Khloe more because her curves add a little to the dress. Last, we have Emmy Rossum and Hilary Swank both wearing a black Gerard Deral peacoat. I love this military-inspired coat, but as an overall look, I have to give it to Hilary. I like that the coat covers her entire outfit underneath and that the complete look is black. Who do you think wore it best? Do you agree with my choices? I agreed with all of your picks. Kelly's look was a little too much, Khloe's shape really accents the dress, and I love Hilary's overall look more than Emmy's (the jacket's collar seems to go up higher and fit her better). In the first I really prefer much more the jumpsuit in Lauren, for Kelly's it looks a little too dark! I disagree with you about the little white dress, so I think that both looks really beautiful with that dress, but for me Ashley wins for appears more elegant.. Finally, I prefer the coat on Hillary, for the same reasons you pointed. Like your choies! For the first two looks I prefer the outfit at left, for the last one the right one! Add a Splash of Neon This Spring!